Whether you’re looking for Sunday brunch, bar food, or a nice family dinner, there are plenty of restaurants in Rapid City to explore, and the team at your Rapid City-area Chrysler, Jeep, Dodge, Ram dealership is here to point you to some of our favorite haunts in town. Check out our Rapid City restaurant recommendations here. Fishing Around Spearfish Have a Favorite Rapid City Restaurant? Family-owned and operated since 1981, the Colonial House Restaurant and Bar is the most popular eatery in Rapid City—and for good reason. This place serves up delicious down-home cooking in a fun, family-friendly environment. It also has a renowned bakery where you’ll find their world-famous caramel rolls. Recently redesigned with a fun outdoor patio space with fire pits, Murphy’s Pub and Grill serves up delicious bar food in a fun and relaxed environment. The sandwiches and burgers are tasty, sure. But you definitely don’t want to miss out on Murphy’s fried pickles. Looking for some tasty brunch items? Tally’s Silver Spoon serves up one of the best brunches in town, and it goes until 2:00 p.m. in case you’re a late riser. At night, enjoy delicious new American cuisine and a great menu of craft beer and wine. Whether you’re looking a quick bite for lunch or a sit down dinner, The Gyro Hub has you covered with delicious gyros, wraps, falafel, and much more. 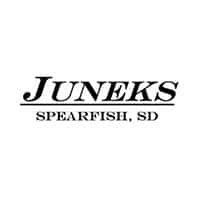 Explore More of Rapid City with Juneks CJDR! The team at Juneks CJDR is here to help you work off that dinner, too, with our guide to the best hiking trails around Spearfish, as well as our favorite camping spots near Spearfish. Our staff is here to serve your needs at 644 West Jackson Boulevard in Spearfish, SD, and you can contact us online by filling out this easy-to-use and secure form.